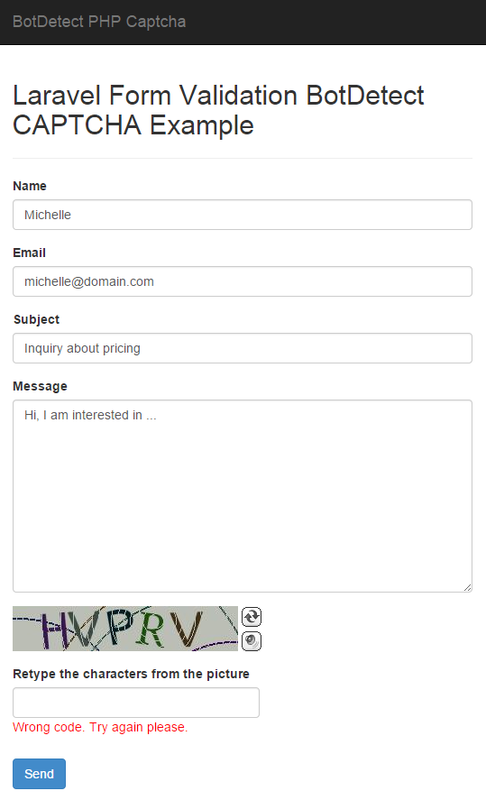 Check the BotDetect Laravel 4.2 Captcha Quickstart for key integration steps. In the code above we have registered HTTP GET and POST verbs for the example page. On HTTP GET request to the example page, the getContact() action of the ContactController is executed, while on a HTTP POST request to the example page, the postContact() action of the ContactController is executed. In order to use the Laravel CAPTCHA Package, we have declared Captcha configuration which will be used when showing Captcha image in contact view. Detailed description of this approach is available in a BotDetect Laravel 4.2 integration guide. The View part of this example is straightforward. The above code uses captcha_image_html() helper function to generate Captcha image. It is required to pass a captcha configuration key defined in app/config/captcha.php file. The View needs to add the required stylesheet of the library by calling captcha_layout_stylesheet_url() helper function. The Controller part of the example provides necessary helpers and data used by View, and adds the Captcha validation functionality as outlined in the BotDetect Laravel 4.2 integration guide. On HTTP POST request (which occurs when user submits the form), the postContact() action is executed and this is where we validate the user's Captcha code input by using the valid_captcha validation rule. Finally, we redirect user to contact page and pass some data to contact view.